Posted on Tue, Jan 31, 2012 : 5:54 a.m.
Jamie-Sue Seal performs during last year's AnnArbor.com Summer Concert Series. Seal organizes the Un-Valentine's Show, which is coming to the Green Wood Coffee House this Friday. “Valentine's started as a day devoted to a saint, but nobody remembers that anymore. We're awash in a deluge of commercial sentimentality, forced attentiveness, chocolates and pink ribbon—an event as mercantile and manufactured as Sweetest Day or those nasty little candy hearts. That’s the sardonic description of The Un-Valentine’s Show from the website for Smokin’ Sleddog Records, based in Lansing and run by Jamie-Sue Seal, who is also one of the four regional singer-songwriters who generally perform at the show. The Un-Valentine’s Show has toured, mostly around Michigan, for the last six years—and makes its Ann Arbor debut on Friday when the show comes to the Green Wood Coffee House series. Joining Seal are Ann Arbor’s John Latini and Dave Boutette. Usually, Andre Villoch, who’s been based in Traverse City for the last 10 years, is also part of the lineup. But Villoch won’t be on board this year, as he’s presently living in Maine and can’t make the trip. The all-acoustic show began as a one-off event back in 2006 in the Lansing area, but was so well-received that it became a regular, ongoing event that has been presented in Canton, Livonia, Detroit, Traverse City and Petoskey, among other cities. 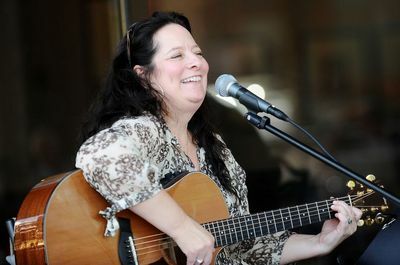 Who: Singer-songwriters John Latini and Dave Boutette of Ann Arbor and Jamie-Sue Seal of Lansing. What: "Songs and Tales of Unforgiveness, Heartbreak, Dysfunction and Revenge." Where: Green Wood Coffee House, First United Methodist Church Green Wood, 1001 Green Road. When: Friday, Feb. 3, 8 p.m.
How much: $12. For tickets, call 734-665-8558. More info: www.fumc-a2.org/coffee_house.cfm. Seal conceived the idea for the show, which is a somewhat free-wheeling event that includes much good-natured ribbing between the performers, and songs that range from tongue-in-cheek send-ups of love-gone-bad to serious tales of post-breakup heartache—and some darkly funny songs about the bitterness and revenge fantasies that sometimes linger after a stormy break-up. 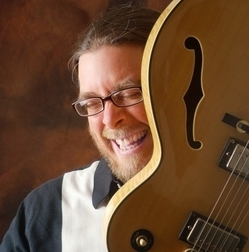 “But the majority of the time, the tone is levity,” says Latini, a busy Ann Arbor artist who, in addition to performing and recording as a solo artist, also fronts the Flying Latini Brothers and does duo shows with Seal. “Even when we deal with the bitterness and revenge aspects, the songs are funny. “Valentine’s Day is advertised as a time when people are lovey-dovey, and it’s all roses and chocolates, but obviously it’s not like that for everybody," says Latini, a New York native. "There’s another side to it, just like with Christmas—a time of year when a lot of people get revved up about it, but for some people it’s a sad time, either because they don’t have money or because of other problems. So, we write songs about that side, for people like us, who maybe have a more cockeyed view of the world,” says Latini with a laugh. And just to underscore how art imitates life, sometimes unwittingly, Latini shares this anecdote: “After we’d already written ‘The Stalker Song,’ and had been performing it for a while, we found out at my mom and dad’s anniversary party that, back when they were young, my dad followed my mom home on his bike to find out where she lived. So that became a running family joke." “It’s essentially a funny tune with the two of us trying to pawn this woman off on the other,” says Latini. Boutette also wrote and performs a double-entendre tune, “Three a.m.,” in which he uses food as a metaphor for “stepping out,” as it were. The singer initially finds himself awake, at 3 a.m., wanting food, but nothing’s open. Fast forward, and his girl is shaking him awake because she “found a piece of cake” in the back seat of his car, describes Latini. Seal has a clever song, “Hole in My Heart,” that uses the classic joke-construction: In the first verse, she’s full of remorse, singing about the hole in her heart, but then the second verse is about the hole in her head, which is a set-up for the third voice, where she sings about the hole she’s dug in her yard where she wants to bury the guy. “I wrote that one specifically for the first ‘Un-Valentine’s Show,’ says Seal, whose “Forget About Me” is another amusing song that “uses some tasteless language.” she says with a laugh. As for their current solo projects, Boutette just released a rootsy new album, “Mending Time,” in December, and Seal is working on a new disc, slated for spring release, tentatively titled “Nobody Loves a Fat Girl,” that’s a mix of originals and covers done in vintage folk style. And Latini is presently completing new record he hopes will be out in May. Its working title is "Lovers, Liars & Losers," and it features guest artists like pianist Al Hill; Latini’s brother Jim Latini on drums; John Sperendi on stand-up bass; the Wilson Brothers (Andy & Joe from Steppin' In It) on trumpet and trombone, respectively; Diana Ladio on violin / viola and Ali Haraburda on cello.